This article was written By John Berra on 08 Jul 2015, and is filed under Reviews. 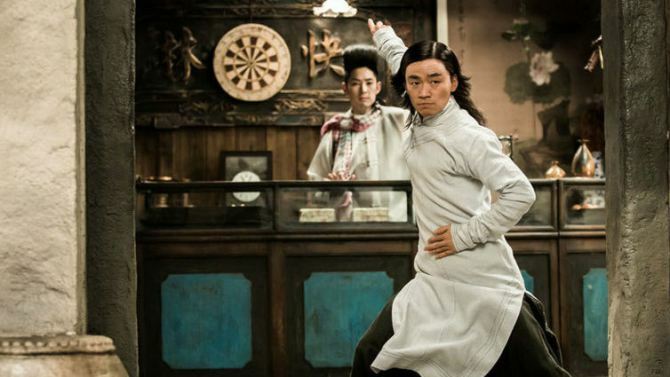 Returning to his comfort zone of Chinese history following a rare contemporary outing with the media satire Caught in the Web (2012), venerable Fifth Generation director Chen Kaige is nonetheless keen to show that he has mastered a new bag of tricks with his martial arts extravaganza Monk Comes Down the Mountain. Adapted from Xu Haofeng’s novel, this is an episodic tale of a young Taoist who must swap his harmonious temple existence for the tumultuous secular world of the 1930s and in doing so wrestles with the impulses of desire and vengeance. Lavishly produced yet staged with a surprising litheness, Monk Comes Down the Mountain proves that Chen is no slouch when it comes to serving up crowd-pleasing entertainment, even if its spiritual truisms are uncharacteristically didactic. The titular temple dweller is He Anxia (Wang Baoqiang) who has been raised in the sheltered environment since being abandoned when he was an infant. During a food shortage, He is sent to fend for himself in the outside world as his martial arts skills ensure that he will have a fair chance of survival. While trying to feed himself without a penny to his name, He encounters kindly herbalist Cui Daoning (Fan Wei) who takes him in and makes him an apprentice at his surgery. Unfortunately, this arrangement comes to an abrupt end when an affair between Cui’s gorgeous wife Yuzhen (Li Chi-ling) and his financially irresponsible brother Daorong (Vanness Wu), comes to light, with He committing his first sinful act in order to take revenge on behalf of his master. Afterwards, he drifts through a run of mentor figures: prodigious fighter Zhao Xinchuan (Danny Chan), mysterious temple sweeper Zhou Xiyu (Aaron Kwok), martial artist turned opera star Boss Zha (Chang Chen), while turning to a Buddhist monk (Wang Xueqi) for guidance at times of uncertainty. It’s through He’s fascination with Zhao Xinchuan’s impressive technique that Chen introduces the film’s main villain, the selfish Peng Qianwu (Yuen Wah), a talented but untrustworthy martial artist who cannot stand the idea of being bettered or having any younger fighters outclass his cocky but gutless son Qizi (Jaycee Chan, unbilled as a penance for his marijuana possession conviction, although a scene in which He and Qizi hallucinate after eating some drug-laced meat may remind viewers of the performer’s recent troubles). Johnnie To regular Lam Suet also turns up in the final act as a heavily guarded mobster with links to Peng. As it becomes apparent that Peng’s history intersects with that of He’s mentors, the Taoist almost becomes a supporting player in his own story as deep ties and deadly rivalries are revealed. He’s life lessons are condescendingly emphasised by an anonymous narrator as the guileless Taoist goes through a series of personal trials that are necessary for growth, yet his identity remains dependent on the ideologies of his various masters, whom he follows without question. This allows more defined characters to move to the foreground, either through narrative machinations or the sheer charisma of key players: Kwok is unusually stoic, while Chang is a graceful presence, and Yuen is splendidly despicable as their sly adversary. A wartime flashback to establish the connection between Zhao Xiyu and Boss Zha playfully references Chen’s classic Farewell My Concubine (1993) with Kwok and Chang making a terrific pairing as polar opposites who become perfect training partners. Moving nimbly through the significant relationships in He’s life gives the film a sense of buoyancy and reflects the serialised format of wuxia sagas. With the introduction of each character and their respective fighting style, the gravity-defying combat sequences become more extravagant and increasingly reliant on special effects, eventually reaching the dazzling pinnacle of “Night or Day Ape Rehearsal” as practiced by Zhao Xiyu and Boss Zha. Chen floundered when using extensive CGI for his misbegotten fantasy effort The Promise (2005), which was rushed through post-production to ride the wuxia wave instigated by the global success of Crouching Tiger, Hidden Dragon (2000), but Monk Comes Down the Mountain finds extensive visual effects being smoothly integrated with impeccable period design. Still, it’s a world that pleases the senses without ever inviting full immersion as the lived-in quality that one usually associates with Chen’s screen histories is here replaced by an unreal aesthetic as he paints with broad strokes in a confident bid for multiplex success. Devotees of the director may consider Monk Comes Down the Mountain to be a worryingly impersonal undertaking, but wuxia enthusiasts will most likely find that it compares favorably with such recent genre forays as Reign of Assassins (2010), Flying Swords of Dragon Gate (2011) and Brotherhood of Blades (2014) as a colorful exercise in traditional storytelling with the obligatory digital enhancements.